When you’re proud of your motor, you want to find a garage that will keep your car safeguarded from the outdoor elements, without compromising on style. This is where our prefabricated garages come in. Whether wooden or metal, our easy-to-maintain garages provide ample room and height for almost any car, giving you space to manoeuvre around your vehicle and keep all your car-related gizmos and gadgets in one convenient place. 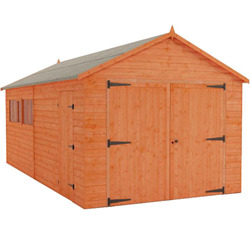 We use sturdy timber to create our wooden structures, which come with convenient side doors to allow you easy access. 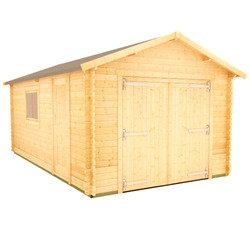 Our metal model comes with a 15-year ‘non-perforation’ guarantee, which assures you that you are investing in a quality garage when you choose a Tiger Shed garage. Garages are not just for storing cars, however. If you’ve got plans for the space beyond making it a showroom, you could transform it into a workshop if you’re a DIY pro, or even a home gym if you want a bespoke fitness suite. However you use them, our garages are totally secure and extremely strong, so you never need worry about your vehicle, tools, or anything else you store in there. We deliver our garages free of charge to most UK postcode areas within 20 days of submitting your order.